Venezuelan President Nicolas Maduro held what he said were the most important military drills in the country’s history at the weekend, as he prepared to confront any potential US invasion. 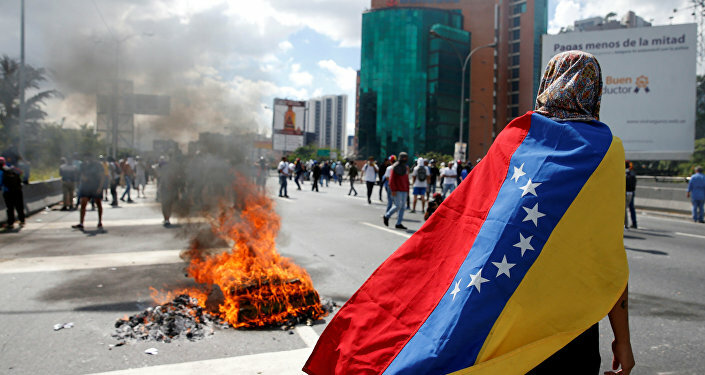 Since his Western-backed opponent, Juan Guaido swore himself in last month, the US has been piling the pressure on the recently re-elected President Maduro to stand down. Last week US envoy to Venezuela Elliot Abrams, who is also thought to have been behind the attempted coup against Hugo Chavez in 2002, just last week suggested that Maduro should flee to Russia or China, describing the current regime as "illegitimate" and arguing for a "transition to democracy" in Venezuela. It’s not clear, however, what grounds Abrams has for referring to the Maduro government as illegitimate, given its recent re-election. Sputnik spoke with Max Blumenthal, journalist and editor of the Greyzone Project.com, currently on the ground in Caracas. Sputnik: There seems to be a bit of a disconnect Max between what we are being told by the western media and what is actually happening on the ground in Caracas. If you were to believe the mainstream media you’d get the impression that President Maduro was an evil dictator who didn’t have any popular support, and you could almost forget he was recently re-elected; what is your sense of the support that Maduro has amongst the Venezuelan people? Max Blumenthal: First of all, the way that this situation has been portrayed here is that it is this vast dystopia, where there are long lines for food, that people are starving in the streets, and the fact is that when I walk out into the streets of Caracas right now I see a bustling city with filled restaurants, with cafes, with supermarkets that do actually have food in them. The issue is that there’s an economic crisis that has been brought about by speculation and hyper-inflation which has been compounded by crushing US sanctions that are making it impossible for this government to get out from under this mess. But my sense is that the government is fairly confident that it has defeated this coup, at least internally, and what we’re going to see today is a massive opposition march calling on the US to intervene, to send in humanitarian aid and many opposition leaders are openly calling for a Libya-style US invasion. Sputnik: Donald Trump’s top Latin America adviser has also claimed “there is not a single scenario” in which Maduro and his “cronies” are able to retain power in Venezuela. How do you think this is going to play out — do you think we could see another presidential election being held as the US suggests or are we going to see US military intervention? Max Blumenthal: I have no idea if the US is going to intervene – they need a pretext first of all – and that’s what I think the humanitarian aid is. The humanitarian aid could consist of some kind of provocation where the army attempts to prevent it from coming in and there’s an escalation. There is a real fear of that and there already have been attempts to provoke the military. There have been reports that an aid plane that was flown in from Miami was filled with automatic rifles and other weapons. Elliot Abrams who is Donald Trump’s Venezuelan Tsar pioneered the tactic – using humanitarian aid as a cover for arming US proxy forces in Central America during the dirty wars of the 1980s. So there is definitely a fear of irregular warfare as well as some kind of invasion from Colombia using the Colombian military as a proxy. And there is also a fear in the streets today that the giant opposition rallies could create some kind of game-changing moment through street violence and there are riots expected tonight in the form of what’s called guarimbas which we’ve seen in Caracas in the past few years and have done enormous damage to the economy. So the situation is really fluid and no-one really knows what to expect. Sputnik: So it’s clear that the US is intent on regime change in Venezuela; but what to your mind is really going on there, what is the motivation behind it, is it as Mike Pompeo said, about helping the Venezuelan people? But that’s not going to happen, the US is not going to allow this to happen, so there’s basically a standoff. We do have to remember though that the US repeatedly called for Bashar Al-Assad in Syria to step down and he’s still in power. So I don’t really see how the US is going to extricate this government which does have a very strong popular base that’s out in the streets protesting in support of it out of power. Having said that, people here are tired, they’re exhausted from years of economic attacks and that also includes Maduro’s popular base. Views and opinions expressed in this article are those of Max Blumenthal and do not necessarily reflect those of Sputnik.